One of the wonderful benefits of working in the wilderness is the potential for interaction with wildlife. Sometimes, we’re entertained by energetic jackrabbits. Sometimes, camels eat our lunch. Always, we keep safety at the forefront. The British Columbia team was fortunate to see majestic bald eagles, curious stone sheep, and many (many) marmots in their natural habitat. We also saw several bears. 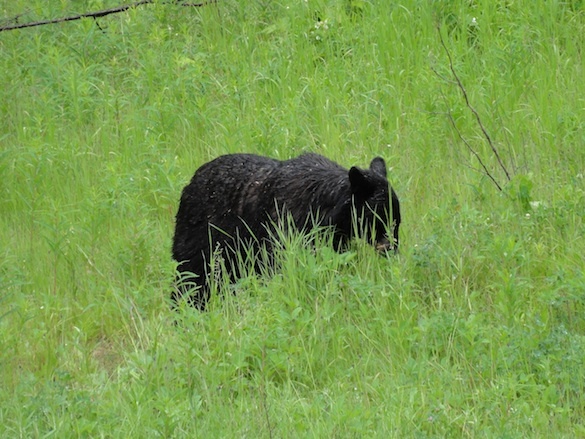 Most of the bears that we saw were black bears eating the fresh grass alongside the road. However, the very first night in the field, we saw grizzlies. 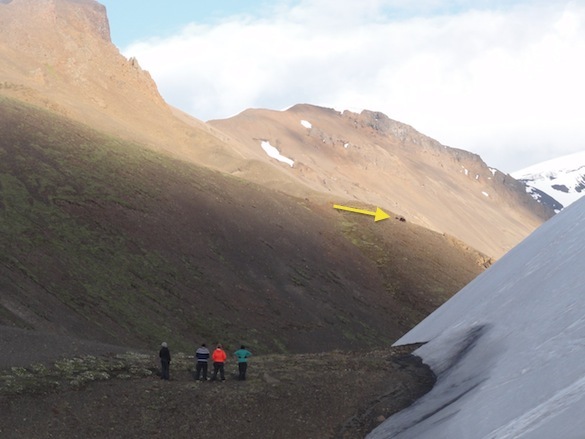 The yellow arrow is pointing to a momma grizzly and her cub. Our anxious group is standing on the edge of our campsite. We were well prepared for a moment like this. Before going to the field, we had several long discussions about bear safety. We knew that the best strategy is to avoid a confrontation. At all times, each of us carried our own bear spray, a pepper spray with a strong propellant. We also had bear bangers, fire-cracker cartridges that are launched with a pen-like launcher. One of the first things we did when we arrived in the field was practice using the bear spray and bear bangers. The bangers worked just as they were designed when we used them that first night. We spotted the momma grizzly and her cub walking across the ridge toward our camp. They didn’t change their course after the first bear banger, so we set off another. The second banger caused them to stop, and the third startled them into running in the opposite direction. Confrontation avoided! As an added precaution, we set up a portable electric bear fence around our tents. The gentle tick of the fence was a comfort at night. 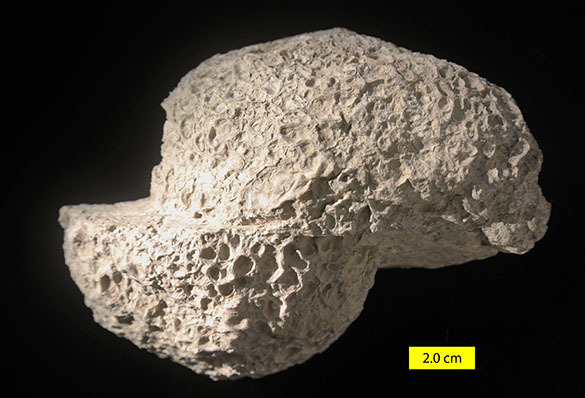 I’m returning this week to one of my favorite fossil types: the ostreolith, popularly known as the “oyster ball”. These were lovingly described in a previous blog entry, so please click there to see how they were formed and some additional images. They are found almost exclusively in the Carmel Formation (Middle Jurassic) of southwestern Utah.They are circumrotatory (a fancy word for “rolling around while forming”) accumulations of small cup-like oysters along with minor numbers of plicatulid bivalves, disciniscid brachiopods, cyclostome bryozoans (see Taylor & Wilson, 1999), and mytilid bivalves that drilled borings known as Gastrochaenolites. They are nice little hard-substrate communities originally nucleated on bivalve shells (Wilson et al., 1998). 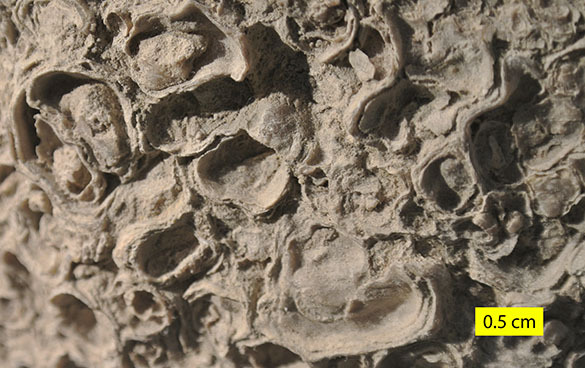 Here is a close view of the oyster valves on the outside of the ostreolith. They are attached to similar valves below them, and it is oysters all the way to the center. What is special about our specimen here is that it managed to obtain a fault right through its center! The chances of this happening are slim, given that they are relatively rare in the rock matrix. The faulting was probably during the Miocene related to a “left-lateral transfer zone that displaces north-south–trending crustal blocks of the eastern Basin and Range Province to the west” (Petronis et al., 2014, p. 534). This is an interesting tectonic region between the Basin and Range Province and the Colorado Plateau. 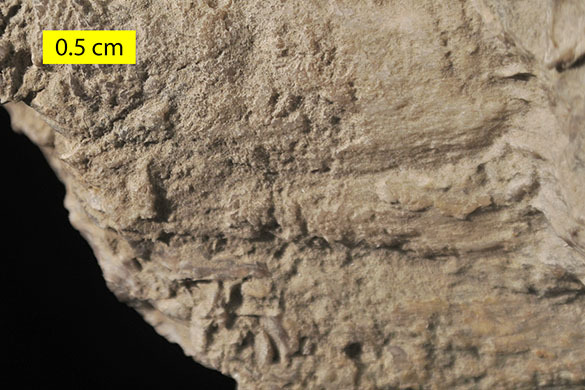 A close view of the fault surface shows it is a striated slickenside. The striations (called slickenlines) are parallel to the direction of movement, not that we have to guess when we look at the ostreolith itself. There are also calcitic deposits here formed during faulting called slickenfibres. These elongated crystals have tiny step-like breaks in them that show the actual direction of movement. Another nice specimen combining paleontology and structural geology. Petronis, M.S., Holm, D.K., Geissman, J.W., Hacker, D.B. and Arnold, B.J. 2014. Paleomagnetic results from the eastern Caliente-Enterprise zone, southwestern Utah: Implications for initiation of a major Miocene transfer zone. Geosphere 10: 534-563. Taylor, P.D. and Wilson, M.A. 1999. Middle Jurassic bryozoans from the Carmel Formation of southwestern Utah. Journal of Paleontology 73: 816-830. Wilson, M.A., Ozanne, C.R. and Palmer, T.J. 1998. Origin and paleoecology of free-rolling oyster accumulations (ostreoliths) in the Middle Jurassic of southwestern Utah, USA. Palaios 13: 70-78.